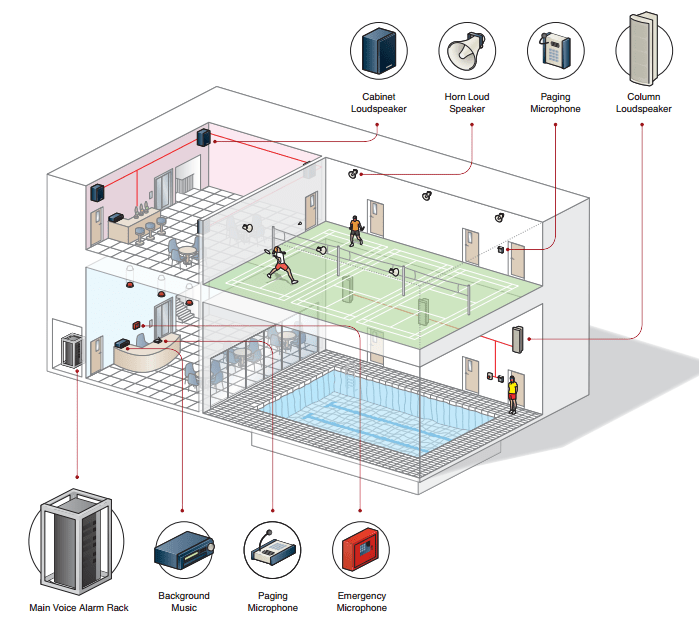 Public address systems and voice alarm systems are advanced fire detection systems which can be expertly installed by Tecserv using products supplied by Gent by Honeywell, one of the leading manufacturers of fire safety equipment. These systems deliver pre-recorded emergency messages through a public address system instead of sounding a fire alarm bell. Statistics show that only 13% of of people respond to the sounding of a fire alarm bell as they assume it is a false alarm. Whereas a spoken message has been proven to be far more noticeable as it identifies the nature of the problem and provides clear instructions for everybody follow. Input controllers are used to project the required sound or message through the PA speakers. A microphone can also be used by an announcer to record a message, or play an audio source. This is particularly useful for the fire service as they can issue instructions via the system which may help save lives and equipment. This is also a feature employees particularly like as they can use the system to play their favourite music! Tecserv works closely with Gent who have been manufacturing detector equipment since the 1930s. They are a prestigious and well respected name within the industry meaning you receive the highest quality product possible. Due to our close partnership with Gent and excellent initiation of their products we are proud to say we have gained the Elite System Integrator status. In order to help you meet fire regulations, the system can also generate people logs and other management information. If you would like more information on public address and voice fire alarm protection systems or would like to book a free survey please call our sales team on 01773 764 726 or complete the enquiry form below.